Although I don’t have access to a plot of land to cultivate my green thumb, I make do with every inch of real estate available to me in my apartment with my itty-bitty home garden. It saves me quick dashes to the store to buy expensive fresh herbs, and I’m further encouraged to include them in dishes as opposed to dried herbs. It’s an absolute boon, and truly, a window garden is very little work. Not to mention the fact that with a little sun and water, basil, dill, parsley and mint are practically unstoppable. 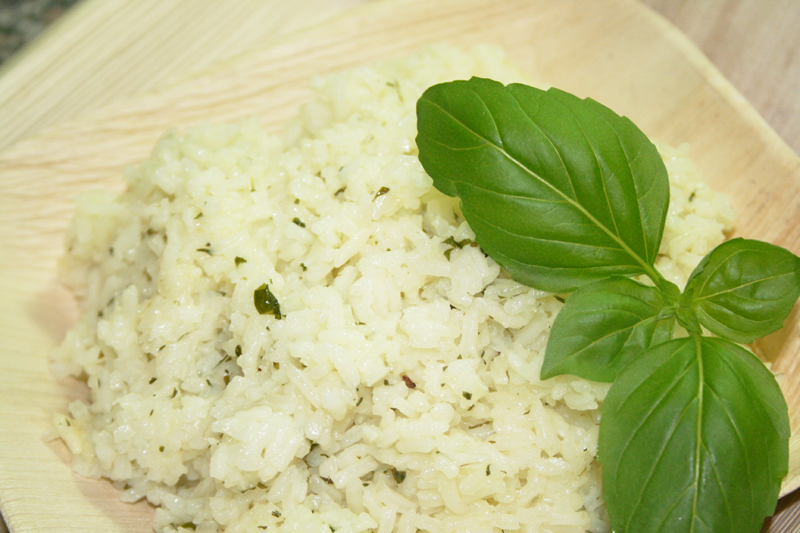 This simple rice pilaf is a celebration of the goodness of fresh herbs – if you are not inclined to grow your own, pick up the prettiest, leafiest bunches from the store or farmer’s market and go to town. This is one of those “make-it-your-own” kind of deals, so absolutely be creative. I like a combination of dill, mint, basil, thyme and parsley, but sage, savory, rosemary and fennel also work well. I use chicken broth in lieu of all water in this recipe, but if you’d like to keep things vegetarian, replace the chicken broth with veggie stock to make things meat-free. Scrap the butter for a little more olive oil, and you’ve got a vegan delight on your hands. Yup, that easy. And speaking of easy, these shots feature Marx Foods Palm Plates – biodegradeable gems that are as lovely to look at as they are sturdy and good for the environment. Check ’em out! Begin by roughly chopping the herbs. Heat the butter and olive oil in a medium pot. Add the rice, broth, water, salt and pepper and bring mixture to a boil. Once boiling, toss the herbs on top and cover. Turn heat to low and cook until all water has been absorbed, about 15 minutes. Fluff rice with a fork and serve. While the French slurp raw oysters and sip champagne for good luck on New Years’ Day, our family would tuck into heaps of black eyed peas, fluffy rice, and collard greens. It’s amazing – I always considered it a southern tradition, what with black-eyed peas grown in Virginia all the way back to the 1600s. But apparently the New Year’s tradition dates back to Rosh Hashana (the Jewish New Year), where in the Talmud it’s recorded that the humble black-eyed pea is a good luck symbol. Apparently, people have been enjoying these little babies for a while. Start with a heavy pot with a lid that is suitable for cooking rice (this is one pot cooking, kids!) and heat your two tbs. of olive oil. Add the celery, onion and bell pepper and saute until translucent. While that is cooking away, drain your black-eyed peas, reserving the liquid in a measuring cup. Add water to make a little less than two cups of liquid. Set both the peas and the liquid aside, separately. Add the garlic, thyme, hot sauce, salt, white pepper and stir. Add your rice and greens and stir the mixture. Allow to cook for a minute and then add the peas. Stir, making sure not to break up the peas and then add the liquid. Bring to a boil, pop on the lid and turn the heat to low. Cook until all of the liquid is absorbed, about 20-25 minutes. Pull off the lid and fluff with a fork. Return lid and let sit for 5 minutes. Fluff again and serve. For this recipe, I often use leftover Couve (Brazilian Style Collards cooked in garlic and oil), but if you are starting from scratch, you can always use frozen collard greens. You can actually nuke them to defrost quickly, drain of an excess water, and then stir them into the rice. 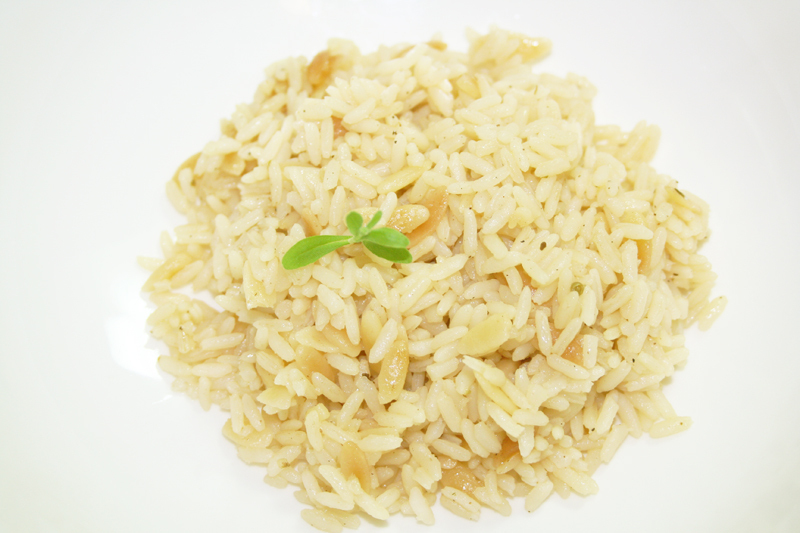 Rice is one of those things that you have to trust to cook and not open the pot until the end. When you open the pot while it’s cooking, you release all the steam inside the pot, which is the secret element to make it fluffy and gorgeous. Keep the pot closed until the last few minutes of cooking when it’s acceptable to open the lid. A trick that I use to tell if the water is absorbed without opening the pot is to carefully put my ear next to the bottom of the pot to hear if there is water still bubbling at the bottom. But be careful – I am not going to be responsible for you setting your hair on fire. You shouldn’t be using that much Aquanet anyways. If ever there was a dish that served as a celebration of my heritage, it’d be collard greens. Marrying the southern roots of my paternal family from Durham, North Carolina, and my south-of-the-equator family on my mother’s side from Belem, Brazil, I get my love of collards fair and square. In my house growing up, we oft ate the Brazilian national dish, feijoada completa. This stew of various meats and black beans had to have a specific list of accompaniments in order for it to be correct – one of these primary components was collard greens. 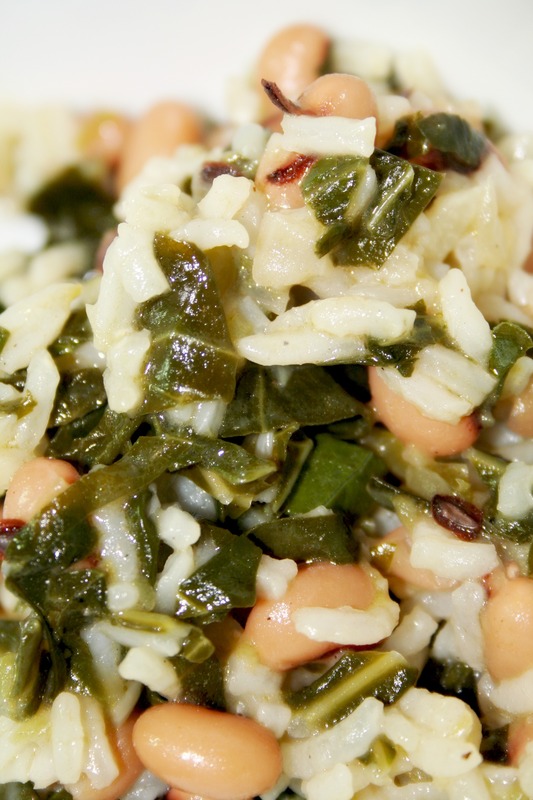 While Mom and I were usually in charge of the black beans and rice, Dad was always in charge of the greens. He had a special method of sauteeing the collards until tender, with his secret blend of onion, garlic, olive oil and ground pepper. The whole process usually involved him breaking into an impromptu blues song about “greasy greens” that I’m sure he made up on the spot. Never a dull moment in the house where I grew up. My version of the greens is closer to the traditional Brazilian preparation the first day that I eat them, but as leftovers, they are so much like my Dad’s version. It’s wild – almost as if both sides of my heritage come out in the recipe in some way or another. A lot of recipes have you simply slice ans sauté the greens, but this is a mistake. You absolutely must blanch and shock them first – this cleans any grit from the greens and takes away a lot of the bitterness. Right is right. Also, by blanching the greens, you’ll reduce the cooking time for the sauteeing portion of the cooking. 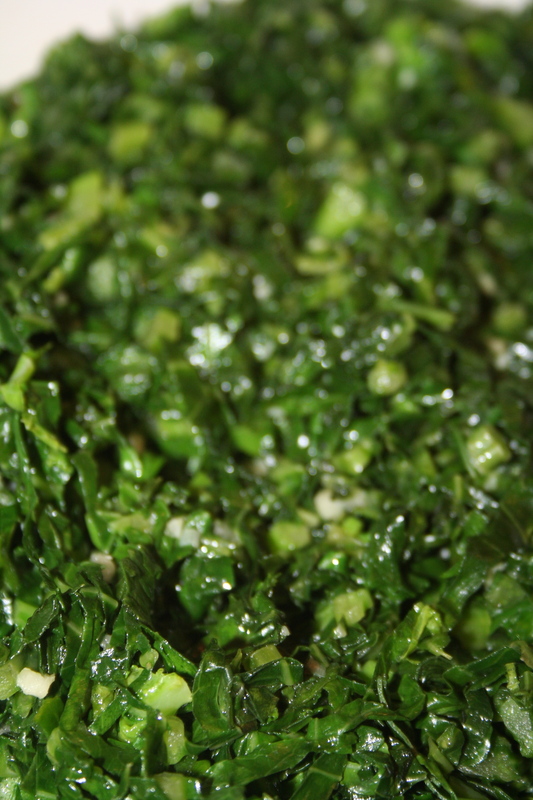 Also, if you have a friend with impeccable knife skills, get them to chiffonade (thinly slice) these greens for you. I get my friend Kate to do it when she is over, because the greens are wispy and perfect when she does it. There’s something to be said for a skillful chop, and kids, she’s got it. Although these are typically served with black beans and rice in Brazil, they are equally delicious with fresh fish, grilled chicken or steak. 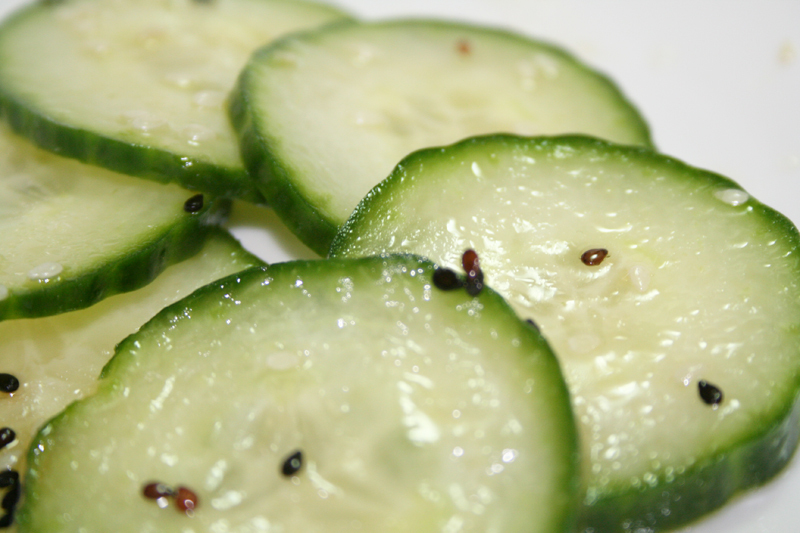 Work them into your repertoire of side dishes for some serious garlicky goodness. And speaking of garlic, if you use that prechopped garlic garbage in this recipe (or any of my recipes for that matter), just pick up your pan of greens and throw them in the garbage. Fresh garlic is key, and if you don’t believe me, I want to punch you in the stomach. Not really, but seriously, use fresh garlic. Happy eating! Put a large pot of heavily salted water on to boil. Begin by rinsing the greens. Place each green on a cutting board and cut out the middle, woody stem. Stack the leaves and continue to prep the greens. When you’ve got about 5-7 leaves prepped, roll the leaves into a fat cigar and thinly slice as finely as you can, forming skinny strands like confetti. Put the collard confetti in a bowl and continue to cut. When the greens are cut and the water is boiling, dump the greens into the water and push them down so that they wilt and turn bright green. You’ll only want them in the hot water for a minute or two. Working quickly, drain the greens and then shock them by running cold water over them. If you don’t shock them with the cold water, they will continue to cook and become to soft. Drain greens well and set aside. In a large skillet, heat the olive oil until shimmering. Add the collards, garlic, salt and pepper and toss in the olive oil. Do not overcook – you basically want to coat the greens in the garlicky oil and then take them off the heat. Your garlic will still be sharp and fragrant, and your collards bright green. Serve immediately. We always think of braising meats to bring out lovely, slow-cooked flavors, but what about veggies? Just as vegetables are delicious barely cooked and raw, so too do they gain character from slow cooking. 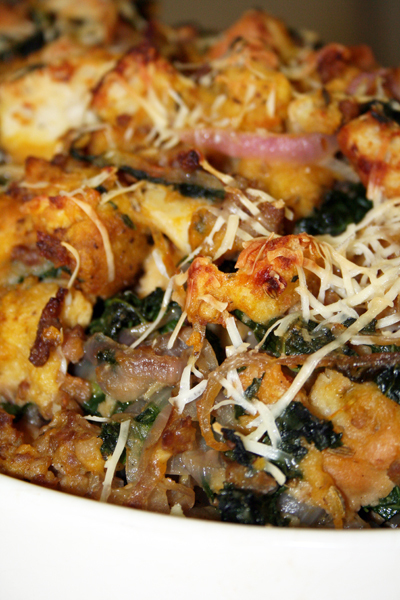 Think of the beauty of caramelized onions, roasted eggplant or smoky greens. This recipe takes advantage of the ability of fresh string beans to absorb savory, saucy goodness when slowly braised in the oven. 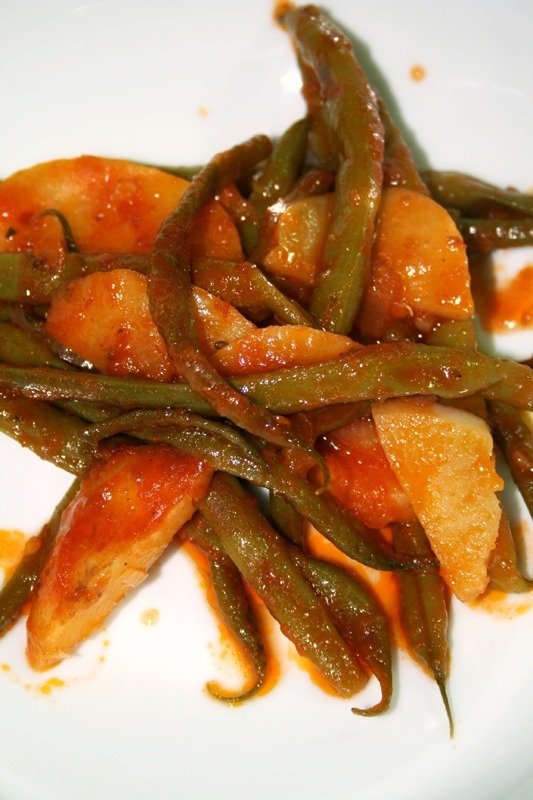 The Greeks often cook their green beans in tomato sauce until tender – this recipe is a spicy variation on that tradition. These green beans are great because there’s no work in making them – just throw them in the oven and let them do their thing. I like to make them with Pastitsio as a spicy side dish. You can start these green beans in the oven and then prep your pastitsio. By the time you put the pastitsio in the oven, both dishes will finish at the same time. Preheat the oven to 375°. Place all ingredients into a dutch oven or oven-safe pot with a lid. Stir. Bake covered for 1 hour and 15 minutes, or until the veggies are tender and sauce is bubbly. For you folks that don’t dig asparagus (like my hubby and sis for starters), you can use this exact same preparation to cook string beans and haricots verts. And also cherry tomatoes on the vine. All of which are gorgeous and couldn’t be simpler. There you go – 3 options for those days that you couldn’t possibly peel yourself off the couch to make anything involved. Preheat oven to 450°. Snap ends off asparagus spears (and save for stock for Cream of Asparagus Soup). 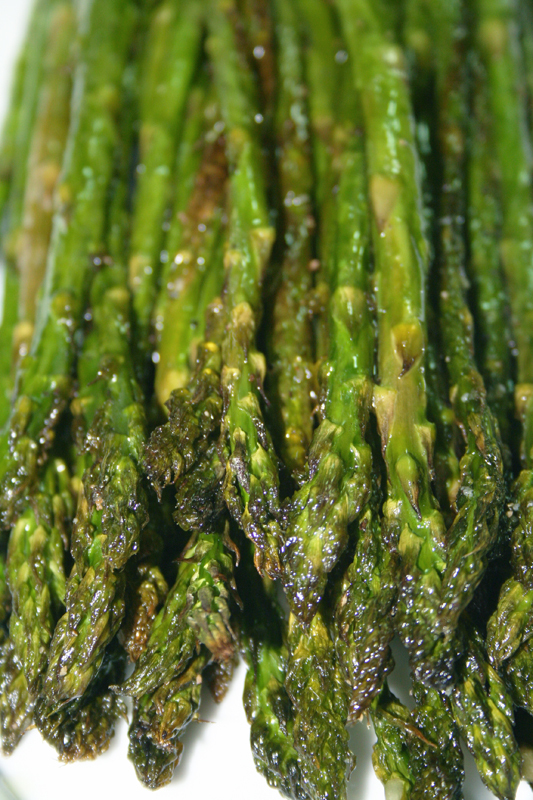 Toss asparagus in olive oil, salt and pepper and spread out evenly over a flat baking sheet. Bake in the oven until crisp and tender (I know, an oxymoron) – about 10 minutes for thin asparagus (cigarette size) and 17 minutes for thick asparagus (cigar-sized). If you want to brighten things up for the summertime, mix 2 tbs. of lemon zest and two tbs. of chopped parsley to make a gremolata. 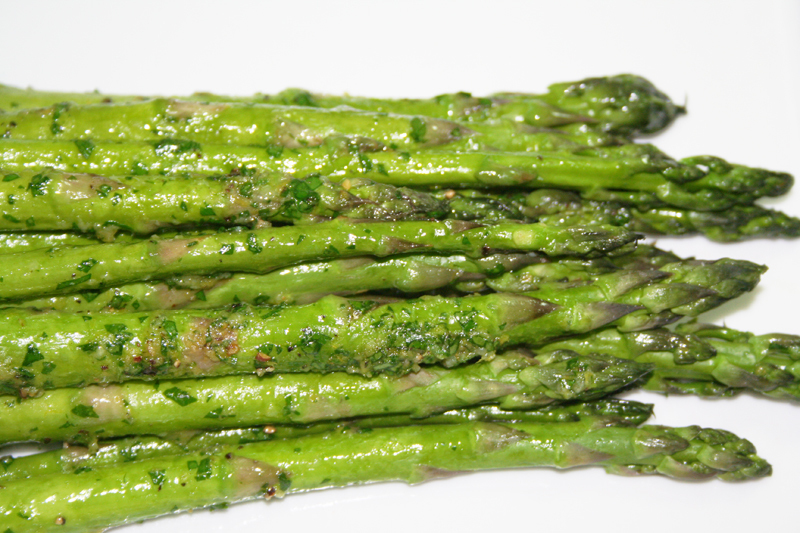 Top asparagus with the mixture and serve. Summer, Summer, Summer Time! Oooooooh, Summertime! Ok, maybe not summer yet, but I do like it when I can get produce to do my bidding at any given season and remind me of the joys of a fruitful harvest from the garden. This salad, based on one that I fell in love with at the restaurant The Smith, is a bright assortment of crisp and tart, sweet and salty flavors. It’ll make you want to sit in a hammock and sway on a warm summer night. This song’ll have you swaying like a hammock.